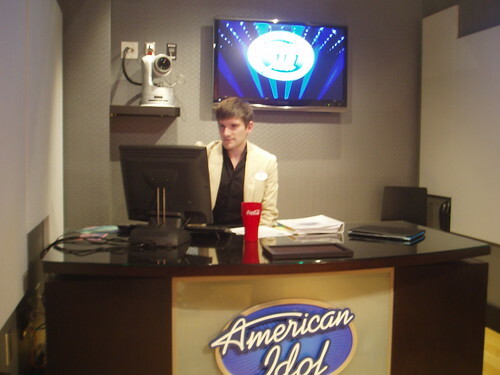 Each day, guests at Disney’s Hollywood Studios (formerly Disney-MGM Studios) have the opportunity to audition for “The American Idol Experience” which is an attraction inside the theme park. Disney anticipates seven shows a day–one every hour on the hour, from noon to 6pm. Each show will feature three singers. During the show, three judges will give their opinions about how the singers perform, but the audience gets to use a control panel on their seat’s armrest to select the winner. At 7pm, the winners of each of the seven previous shows perform in a finale showdown. 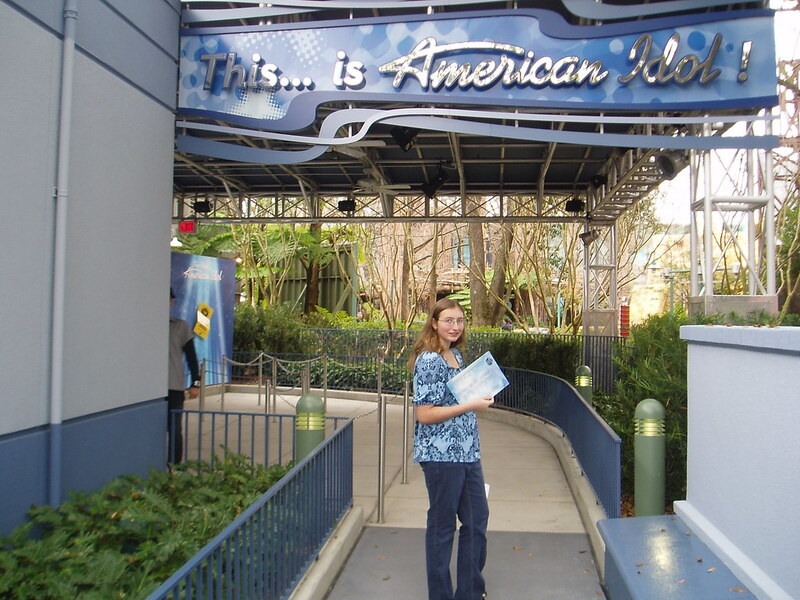 To audition for the American Idol experience at Disney you have to be at least 14 and there is no upper age limit. Guests between 14 and 18, need a parent to accompany them and sign a release form. However, no matter how you wow the audiences at Disney you have to be between the ages of 16 and 28 to go on to audition for the real TV show. Only 21 performers are chosen each day so Disney expects the slots to fill up quickly. After watching a short video and signing a release form, you are taken into a small room where a “Casting Director” sits behind a small desk with a laptop and a clipboard. You may take one person into the room with you. You then sing, a capella, any song you want. Sometimes the Casting Director will stop you and give you some advice or feedback. If the Casting Director thinks you are good enough, you get to go before the Producer. If not, you are finished. Only about 10% of those who audition make it to the Producer. If you’re one of the lucky ones, you are escorted to a sitting area called “The Coke Room”. In this room, you are given an Ipod with just over 100 songs on it. You have to choose one of these songs to sing, Karaoke style, in front of the Producer. If you are selected to perform in a show, the song you have chosen will be the song you sing in the show and it is no longer available for someone else to choose on that day. You are given just a few minutes to listen to the song’s rendition and practice. It is important to note that, for the sake of timing, most of the songs are cut short from their original length. Get a copy of the list of the 100 songs before you go into your audition. (Cast Members have them outside the audition area.) Choose two or three songs you can sing for the Producer before you even begin to audition. This way, you can practice for the entire 10 minutes between auditioning for the Casting Director and auditioning for the Producer–instead of wasting your time trying to select a song. Next you are ushered to the Producer, who also sits behind a small desk. His laptop displays a video image of you and above his head is a large, flat screen monitor that projects the words for your chosen song. Time is of the essence, so sing your heart out. He decides whether or not you will make it onto the stage. Punch It! and SHINE! If you are chosen, you are given a time to return for preparation for your performance. If you have family or friends in your party, they are given preferred seating at your show. In addition, until your “call” (theatre-speak for the time you are required to report to the theatre) you are given a placard announcing that you are performing and you are allowed to walk around the theme park and encourage everyone to come see your show and vote for you. Make the most of this—remember, the audience chooses the winner, so the more people there who know you better than the other performers, the better chance you have! During the show, you will be introduced and then you’ll strut your stuff. In addition to spectacular lighting effects, there will be a video matching the song you are singing displayed behind you to enhance your performance. This is no time to be shy. PLAY IT BIG! Move your arms, move your body, walk a little (if appropriate), connect with your audience, bare your soul, PUNCH IT! and SHINE! At the end of each song, the judges give a review. The host encourages the audience to cheer for all the good reviews and to boo any negative feedback. Make sure your family, friends and everyone else you encouraged to watch the show cheers loudly for you! These reviews are part of the show but have no direct impact on your chances of winning (unless the audience listens to them.) So if the review is bad, use your body language and facial expressions to let the audience know they should ignore the judge and vote for you. After the “judges” give their feedback for the final performer, it is the audience members who will select a number on their chair’s armrest corresponding with the performer they feel should win this round and go on to the finale 7pm showdown. This is the vote that really counts! At 7pm each day, all the winners from the previous 7 shows perform in a finale showdown. This show will crown the “Best Singer” of the day at the American Idol Experience at Disney. 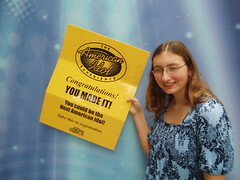 Best Singer for the day at Disney’s American Idol Experience! And that, alone, is quite an accomplishment. This entry was posted on February 20, 2009 at 1:05 am and is filed under Tips. You can follow any responses to this entry through the RSS 2.0 feed. You can leave a response, or trackback from your own site. Self-promotion. It trumps talent every time.